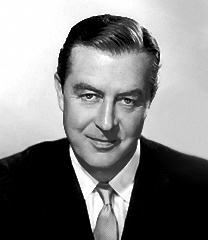 A debonair Welshman whose cool, handsome exterior showcased a wide range of acting abilities, Ray Milland's good looks may have smoothed his entry into filmmaking in the late 1920s, but ultimately it was his talent that kept him in demand as an actor for more than five decades and 120 films. In everything from screwball comedies to film noir dramas, Milland delivered consistently credible performances, even when he had little to work with, making him one of Hollywood's most reliable leading men of the 1940s. Ray Milland stumbled into acting in the late 1920s when a British filmmaker spotted him at a party and offered the 22-year-old a bit part in THE PLAYTHING (1929). After a half-dozen similarly insignificant roles in British films, "Raymond Milland" traveled to the United States under a short-term contract with MGM to try his luck in Hollywood. 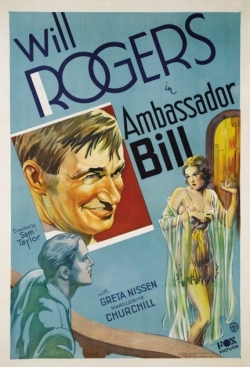 MGM shortened his first name to Ray and continued casting the acting novice in minor supporting roles, although the studio did agree to loan him out for more substantial parts in Will Rogers' AMBASSADOR BILL (1931) at Fox in which he tries to overthrow the boy-king of a fictional European country, and Warner Bros.' BLONDE CRAZY (1931) in which he competes with con-artist James Cagney for Joan Blondell's affections. When his contract with MGM expired, Milland bounced around taking whatever roles he could get, including a supporting part in Fox's CHARLIE CHAN IN LONDON (1934), even returning to England for two movie roles in 1933. Finally, based on the strength of two films he made with Carole Lombard -- BOLERO and WE'RE NOT DRESSING, both 1934 -- as well as the endorsement of his leading lady, Paramount Pictures signed Milland to a long-term contract. He would remain with the studio for some twenty years. 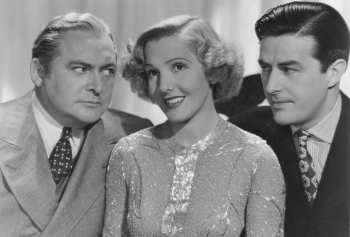 Milland made a number of film comedies over the course of his career, but few have stood the test of time as well as EASY LIVING (1937), a depression-era screwball comedy written by Preston Sturges and starring Jean Arthur, one of the decade's best comediennes. The story of a wealthy financier (Edward Arnold) who gets fed-up with his spoiled family, kicks his son (Milland) out into the real world to get a job and (inadvertently) gives his wife's fur coat to a struggling working girl, thereby turning her world completely upside down, EASY LIVING combines screwball comedy with social satire to teach a fun lesson about judging a person's socio-economic status by his or her outerwear. Though Arthur is certainly the star of the film, Milland more than hold his own comically as her leading man, and the film is an often-overlooked delight. Another enduring example of the range of genres represented in Milland's career, Paramount's BEAU GESTE (1939), adapted from the 1924 novel by Percival Christopher Wren, is an adventure tale in the best tradition of both imperialist literature and pre-World War II Hollywood's fascination with exotic overseas colonial locales. 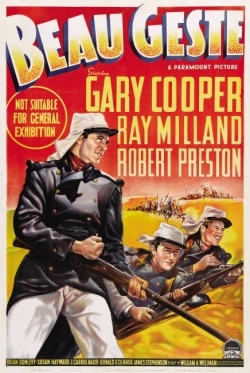 Starring Gary Cooper as the title character and co-starring Milland and Robert Preston as his younger brothers, the film follows the Gestes from their boyhood in a wealthy English manor house to their coming of age in the French Foreign Legion. Directed by William Wellman, BEAU GESTE was somewhat overshadowed by such landmark adventure films as GONE WITH THE WIND, STAGECOACH and GUNGA DIN released the same year, but stands alongside THE LIVES OF A BENGAL LANCER (1935) and THE CHARGE OF THE LIGHT BRIGADE (1936) as some of the best Kipling-esque adventure films of the decade. By the time of REAP THE WILD WIND (1942), Milland's stature in Hollywood and at Paramount had risen to the level of leading man. In fact, he received top billing over both John Wayne and Paulette Goddard in Cecil B. DeMille's 19th century shipping adventure. 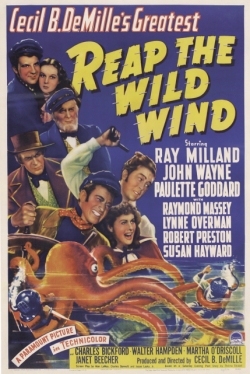 Featuring Oscar-winning special effects, including ship wrecks, giant squid, and some pre-scuba diving, REAP THE WILD WIND's reliance on then-cutting-edge cinematic technology dates it somewhat, but Milland has quite a bit of help carrying the plot of the film, and the story, along with its impressive Technicolor cinematography by Victor Milner, have helped it weather the years.